I just signed up for YNAB and we had a credit card balance when I joined. We made payments totaling the balance -- I entered those payments in the Budgeted line on the card. Since making those payments, our CC balance is now $272.46, but the Payment bubble says $514.65, and my "To Be Budgeted" is red for $514.65. What on earth is going on? I'm so confused. The account is reconciled (which I had to do in YNAB, even though all transactions lined up...maybe that's the issue?). I haven't spent over my budget on any line items. I entered those payments in the Budgeted line on the card. I'm not clear on what that means. When you started, did you budget the beginning amount owed to the credit card payment category? If you sent a payment and there was no/not enough money in the category, you overspent the category. Did you categorize the payment? That messes things up, too. The payment should be recorded as a transfer from the payment account to the credit card account. If I missed the mark, I know someone will jump in here shortly to help you get it straight. There is a learning curve, but once you get it, you'll love it! Relieved - the budgeted amount in the CC line is equal to the amount of the payments sent. The payments are recorded as payments/transfers from other accounts. Lavender Violin - I understand that. But if this is the case, and it's just moving from one category to the CC line, then why is it also saying that I'm over-budget? I've reviewed everything a million times and I just can't understand it. LilBee I notice that the balance you have on your credit card is positive (green). Does your actual card have a positive balance? Also, was that transaction you show an automatic adjustment or a payment? adriana01 No, it doesn't have a positive balance. We owe the $272.46 for the next payment. LilBee Yes. Definitely delete that transaction. If your card is -272, you have accidentally added over $500 to the account to get it to positive $272, and that's probably the entire problem. I don't even understand what is going on...le sigh. Looking at the header, it says there was $19,157.03 available To Be Budgeted in February, but $19,944.14 was budgeted - causing that negative. When you add a credit card and you plan to pay it off in full, you need to budget for the Starting Balance in the credit card category - not the entire payment you plan to make (unless those two numbers happen to be the same). Any transactions made after that starting balance, should be budgeted for in the category you categorize them to - then YNAB will move the funds from that spending category to the credit card category for you. If you pay your credit card in full, the credit card category available amount should always match the credit card account balance. 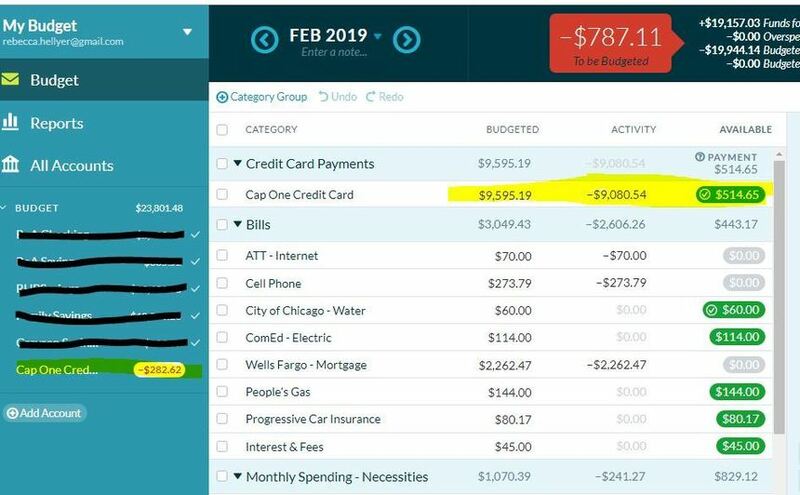 Based on the screen shot above, $9363.16 should be in the Budgeted column - that will change the credit card category available amount to $282.62 and your To Be Budgeted to $555.08. From there, take a look at your other categories and subtract from your categories until you get the To Be Budgeted back to zero. Like, whyyyyyy does my payment not match the balance?? That big negative red number is making me nervous, because I know we're not over budget anywhere, and I don't want to keep shuffling stuff around to compensate for it. LilBee Red in the TBB means you have budgeted more money than you currently have available. You may expect to get this month ey later this month, but YNAB makes you work with what you have now. It sounds like this your first month using YNAB, and that you intend to pay your credit card balance in full every month. In that case, in the first month you have to budget for the balance on the card, which it looks like you tried to do, and then any future spending will happen from budgeted categories and the funds moved into the payment category. I know we're not over budget anywhere, and I don't want to keep shuffling stuff around to compensate for it. Being over budget in YNAB does not mean overspending what you budgeted. The red TBB means you have "budgeted" more money than you have. YNAB treats overbudgeting and overspending as two different things. You can be overbudget without overspending, and vice versa. If you are new to YNAB, you really need to look at more tutorials and read through the YNAB Method before you start. YNAB is not like other budgeting tool and trying to use it any other way will lead to frustration and confusion. You need to remove money from the credit card line until the number in available matches the number due on the card. That will help you some.